Adventure Rabbi Blog - Rabbi Jamie Korngold - the Adventure Rabbi: My latest book: Sadie and the Sukkah Breakfast is Getting Rave Reviews! 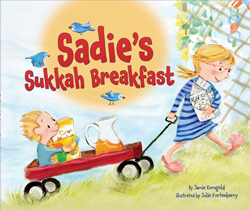 My latest book: Sadie and the Sukkah Breakfast is Getting Rave Reviews! --"Sadie got the cereal. / Ori got the spoons. / Ori got the bowls. / Sadie got the milk." And when juice, challah rolls, cups and napkins make the tray too heavy, then--"Sadie got the juice. / Ori got the cups. / Ori got the napkins. / Sadie got the challah rolls," each bringing an item out to the Sukkah table, setting up "an elegant breakfast." Seeking to complete the experience with the required invited guests for this holiday meal, Sadie and Ori fill seats at their Sukkah table with a menagerie of favorite stuffed animal friends. Lively, colorful illustrations depict these independently capable preschoolers performing tasks with active joy, care and assurance, deftly matching the unadorned, sprightly text. Blessings abound for the autumnal holiday, with these happy kids and (behind the scenes) grateful parents."